Written by Janet Choi on November 29, 2016 . People who sign up for a free trial are usually newbies, who don’t yet know how a product can best serve them. Recognizing that their various buyer personas require different information to get started, the Clearbit team knew they needed to find a way to match the right message to the right users. Upon realizing that their buyer personas’ needs hinged on their job expertise, Clearbit decided to segment their welcome email drip campaign based on a user’s role. Take a look at two of these emails that have a 64% open rate. 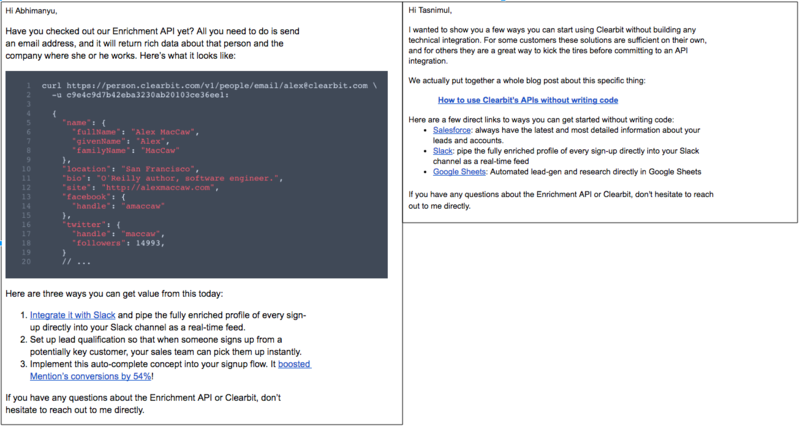 click for larger view The email on the left provides developers a peek into how the Clearbit API operates, showing an example cURL command and the data Clearbit returns. The email on the right, on the other hand, addresses a marketer’s concern, reassuring that building a technical integration isn’t necessary to explore and find value. There’s plenty to do to get started “without writing code” using 3 popular non-technical tools. To accomplish this message personalization, Clearbit turned to their Clearbit integration with Customer.io. The integration sends new signups to the Clearbit Enrichment API, which passes information linked to the email address, including data points like role and seniority, into Customer.io. From there, they created a simple segment based on the role attribute data now in Customer.io. Instead of sending a catch-all email with a generic “check out all the cool things you can do” message, Clearbit addresses specific use cases relevant to their various audiences. As a result, their conversion rates are between 4.9% and 6.3% through the welcome series alone. click for larger view People who plan to enrich their lead and customer information get the email on the left, which includes helpful tips for how to boost their sales and marketing conversions, all with example case studies. Those who plan to integrate Clearbit with their own product receive the more technical email on the right, with pointers on how to best navigate the API. The risk of sending the same email to everyone is that the message is irrelevant and fails to resonate (and prompts an unsubscribe). Clearbit doesn’t make their customers do the mental work of cherry-picking their own relevant bits from a message and instead automatically delivers personalized tips. It’s up to Clearbit to make sure that their customers find long-lasting product value. To deepen engagement, the team points out how customers can use Clearbit with tools they’re already using. The email on the left tells Jan how to get more out of Marketo, a tool he’s already using, by using Clearbit. The same goes for Brian in the email on the right, but with Google Sheets. Instead of sending an email cataloging a laundry list of integrations on offer, Clearbit sends this email addressing a very specific use case. As a result, the email is engaging, the customer is happier, and the product is stickier. There’s a lot going on behind the scenes of that seemingly simple email. Not only does Clearbit use their own Enrichment API to pass through data points about tools in use into Customer.io, they manage all the message variations in a single email, using Liquid. 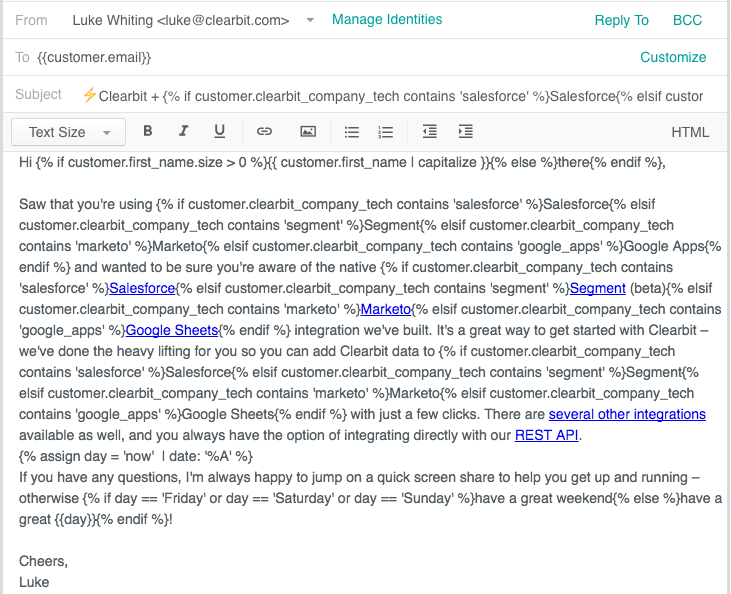 With Liquid powering “if/else” logic to show different text in both the body and subject line, Clearbit creates one email covering four different use-cases—the integration of Salesforce, Segment, Marketo, or Google Sheets. At a 59% open rate, this simple integration suggestion gets a 5.5% click-through rate. Clearbit built an entire company around the principle that data is paramount. But gathering information is only the first step. It’s even more important that you put that data to good use to create a great experience for your customers. By getting creative with enriched data in Customer.io and some experimentation, Clearbit came up with a robust email strategy. Clearbit can equip their users to be successful in their businesses, and it pays off big time. Learn how to set up the integration between Clearbit and Customer.io (or via Segment). Explore why 1,100+ businesses trust their messaging to Customer.io. © 2019 Peaberry Software, Inc.